Holiday portrait sessions are underway! One of the most common questions that I am asked is, "What should we wear?!?" The following advice is only meant to serve as a general guide. Remember, this is your family's photo session and should reflect the true you. If you don't think the suggestions work for your family, throw them out the window and follow your instincts! My top suggestion is for the family to coordinate their outfits. This does not mean that everyone should wear the same plaid sweater or even the same color. This just means that if all of the outfits were laid out together on the bed, they would look good together. There are several variations of this. Everyone wears the same color. This works best if the outfits have various "textures" to add depth. Layering can help with this. Everyone wears shades of the same color (ex. shades of brown or blue). Everyone wears different colors that look good together (ex. gray and burgandy). This one is my personal favorite. One person wears an outfit with a pattern of some sort and everyone else wears solid colors that are part of the pattern. This one is a little more confusing, so hopefully the examples will help. In the first example, the daughter's dress is the piece that pulls everyone's clothing together. Mommy, Daddy, and the son are wearing solid colors pulled from the daughter's piece. Remember, even though these are holiday photos, you can use colors other than red, white, and green. The second example was contributed by Renae Virata of What to Wear for the Weather Wherever You are in the World. You can visit the website by clicking here. Everyone should be wearing clothes that are the same level of "dressiness." It should look like everyone is going to the same place, not like one person is going to the prom while another person is going running. It's okay to be formal or casual, but everyone should be comfortable. Make sure everyone feels comfortable in their clothing whether they are sitting or standing. It's more difficult to get real smiles from children if they are pulling on itchy clothing or feel like they can't move. 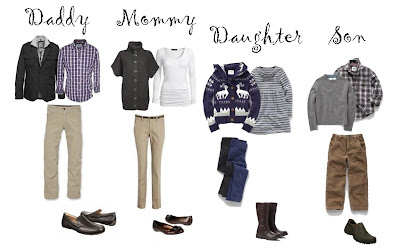 Everyone should dress for the same season. Avoid large logos or slogans. They will detract from the overall picture. Don't forget, your shoes will be in some of the photos, too. They should be considered as part of the outfit. Usually white socks should be avoided as should running shoes. You can wear your normal amount of make-up for your session. The day of your session may not the best time to try a new hairdo. Style your hair however you prefer it styled. Typically 3/4 sleeve to long sleeve looks best for fall/winter photos. This is especially true if you are self-consious about your arms. Photographs tend to make them appear wider than they really are. Generally skirt lengths should not be much shorter than right above the knee. Don't forget your hands! They will be in the photos as well. They don't have to be professionally done before the photos, but should be clean and look nice. Keep your jewelry simple. It should complement you and your outfit, not be the focus of the photos. If you wear glasses, remember they can cause a glare in photographs. If you sometimes wear glasses, the easiest fix is to take them off for the photos. If glasses are essential to your look, consider having the lenses removed for the session. Many times you can get this done for free. Large watches can also cause unsightly glares. Unless there's an important story behind the watch and it's necessary for the session, it's easiest to just take it off. Make sure everyone gets their usual naps during the day. Feed your children a snack (before dressing). Most sessions are done in the late afternoon/early evening. Hungry children are usually cranky children (at least mine is!!). If your baby is at the age where they spit up often, consider dressing them upon arrival or keeping a bib on them until picture time. Bring wet wipes for runny noses and dirty faces. If your child still uses a pacifier, bring it. Even though you probably don't want it in the pictures, it can be used between pictures if a child gets upset. Please do not dress young children (9 mo and younger) in outfits with large collars or overalls. They tend to cover up too much of the child's neck and face. Once again, most of these guidelines are just suggestions. 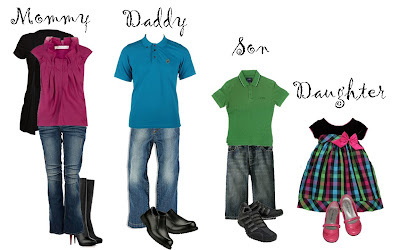 Make sure you dress your family as you want to remember them at this stage in your lives. I look forward to capturing the true you!